Walsall winger Milan Lalkovic says he is impressed by how far the League One club has come since he was last at The Banks's Stadium two seasons ago. The Slovakian, 22, rejoined the Saddlers after he was released by Barnsley in July and has helped the club to second in the table. "I thought we'd do well but not in the first two," Lalkovic told BBC WM. "We are consistent and when you have your good players doing that and others coming in too, that's the result." 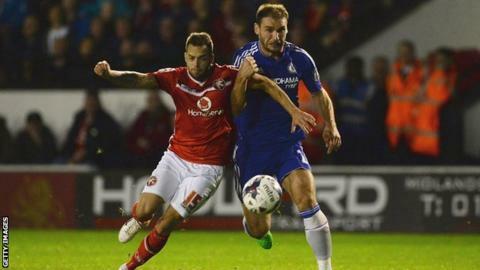 Former Chelsea trainee Lalkovic, scored six goals in 38 league appearances while on loan at Walsall during the 2013-14 campaign and already has half that total so far this term, after scoring in his last two games. "I scored a few goals in my first spell and I want to beat that this year," Lalkovic added. Walsall's current haul of 29 points from 15 games is their best start to a League One season since 2004-05. They did manage 34 points from 15 games on their way to winning the League Two title in 2006-07. "I had a lot of starts at Barnsley last season but didn't get the results but I've grown up a bit and I'm managing my game a little bit more. "I'm a threat and I have the end product - which I can still improve - to go to the next level, I just need to keep it up." The Saddlers are looking to win promotion to the Championship for the first time since being relegated from the second tier under Paul Merson in 2004. They will go top of League One if they beat current leaders Gillingham at home on Saturday. And Lalkovic is looking forward to another big crowd at The Banks's Stadium for the occasion. "It makes a difference - it adds that extra bit of motivation," he said. "It's a top-of-the-table clash so what more reason do people need?"